Some weapons systems that functioned effectively in the “pre-perestroika” era gradually became outdated and were not replaced in the new Russia. Anti-submarine defence is one such system. Russia is mulling the idea of re-starting production of the amphibious helicopter Mi-14, which used to be the terror of NATO submarines. The backbone of Russia’s ASW (anti-submarine warfare) forces comprises the ship-based helicopters Ka-27, amphibious aircraft Be-12 "Chaika", anti-submarine IL-38 and the long-range anti-submarine aircraft Tu-142. Of these, only the last two aircrafts have been upgraded (or are being upgraded) in accordance with modern requirements. Naval aviation experts see the return of the amphibious helicopter Mi-14 as one of the options to strengthen the capacity of the country’s naval aviation. The Mi-14 used to be a reliable barrier against NATO submarines in the territorial waters of the Soviet Union with the ability to stay in the air for 5.5 hours and patrol the coastal waters up to a distance of 300 km. It would be armed with organic weapons consisting of a 1-kt nuclear depth bomb, or a homing anti-submarine torpedo, or eight bombs weighing 250 kg, reinforced in the course of modernization in the early 80s with ability to carry "air-to-ship" missiles, all of which made this helicopter a formidable weapon. A total of 273 units of the Mi-14 made for the Soviet Navy in three versions; anti-submarine, rescue and minesweeper; were gradually retired from the Russian Navy. In an interview to “Business Online,” Yevgeny Matveyev, Senior Researcher at Zhukovsky Academy, confirmed that the Ministry of Defence has allocated funds for the restoration of 10 Mi-14s. According to him, the three-stage restoration programme is underway for the return of these amphibious aircraft to the fleet; repair of machines in storage, modernization of the restored machinery and the re-launch of production. According to Captain (1st Rank) Konstantin Sivkov, Doctor of Military Sciences and president of the Academy of Geopolitical Problems, despite the fact that Mi-14PL has become obsolete, there are no alternatives to it today. He believes that equipping the helicopter during modernization and re-launching its production with search and target systems, similar to "Novella" systems used in naval aviation, will greatly enhance its combat capabilities. There are other views, with the re-launch of production of the Mi-14 being considered a costly exercise. Also, due to the loss of equipment and documentation necessary to reconstruct the machine, the actual exercise will be a complex matter. However, in the short term, domestic aircraft manufacturers are unlikely to be able to offer anything comparable to this unique combat system. According to Roman Gusarov, chief editor of the industry portal Avia.ru, even with the start of mass production of the new Mi-38 in 2015, one can not talk about the recreation of the amphibious version of this rotorcraft. It is estimated that 100 ‘new’ Mi-14s will be built. Analysts are speculating about the choice of site to begin production. 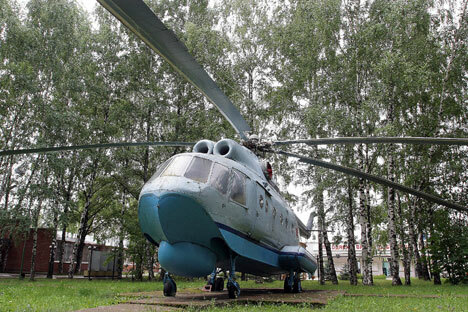 According to Oleg Panteleyev, chief editor of "AviaPort", one of the preferred options is the Kazan Helicopter Plant, where the Mi-14 was built during Soviet times. The project, which according to defence analysts, was shut down because of direct interference by the United States after the incident with a NATO submarine, (blocked in the territorial waters of the USSR by these helicopters in the late 1980's), has bright chances of making a comeback. With the Russian Federation developing the Arctic territories, there are calls for a full complement of amphibious forces not only with rescue machines, but also with high-impact ones. The Mi-14 would be able to meet these challenges.